Actors have walked off Phelim McAleer’s “Ferguson”, a staged reading of testimony surrounding the police shooting of Michael Brown. CO TYRONE FILMMAKER and writer Phelim McAleer is battling a revolt by cast-members, just days before the Los Angeles debut of “Ferguson”, a controversial staged reading of events surrounding the death of Michael Brown. Brown, an unarmed 18-year-old black man, was shot dead by Officer Darren Wilson in August, in Ferguson, a suburb of St Louis, Missouri. His death sparked intense protests across America, especially after a grand jury failed to indict Wilson. That’s where McAleer’s project focuses. It is billed as “using only Grand Jury testimony”, and will invite audience members to vote as if they were on the jury. The “verbatim theatre” project is scheduled to start in Los Angeles tomorrow, and run until Wednesday, but has already prompted a walk-out by eight of the 13 cast members, and caught the attention of the US media. Golden Globe-nominated veteran actor Phil Casnoff, who was due to play prosecuting lawyer Bob McCullough, left the production after reading the script. “It felt like something was very wrong and imbalanced about the piece at the end of the reading,” he said. “Several others are expressing misgivings…but I won’t be changing the script,” McAleer told TheJournal.ie by phone from Marina del Rey. Regardless of how many people have left, the play will go ahead. McAleer says he has replacement actors in mind who have already agreed to fill any gaps left in the cast. Five actors left the production after reading the script earlier this week, but following a meeting between McAleer and the cast on Thursday night, three more walked away. Virtually everyone else involved, the director included, believed that he/she was going to be part of a meaningful piece of theatre that would shed light on a significant societal ill in this country and encourage a broader discussion about it. I’m afraid that’s exactly what Mr. McAleer’s work does and I cannot in good conscience be a part of it. McAleer has a record of making provocative documentary films that rail against pervasive narratives – like FrackNation, a direct response to the popular, anti-fracking documentary Gasland, and Not Evil Just Wrong, which challenges Al Gore’s An Inconvenient Truth. In 2005, he and his partner Ann McElhinney made “The Search for Tristan’s Mum”, about an illegally adopted and abandoned Indonesian child, which was shown on RTÉ. McAleer is currently working on a TV movie telling the story of Kermit Gosnell, a Philadelphia abortion doctor convicted of multiple murders. It’s the perfect story for verbatim theatre. All the evidence is there, 5,000 pages of it. It’s a stunning, important, historical story. McAleer is a former journalist at the Irish News, Sunday Times, Financial Times and The Economist. What’s the point in being an artist or journalist if you’re not going to tell the truth and correct the record? If you’re just going to repeat what everyone thinks is the truth, then you’re a stenographer for liars. When it comes to the shooting of Michael Brown by Darren Wilson, McAleer claims some major untruths have been propagated and accepted. The truth is the truth. If your beliefs don’t coincide with the truth, then you need to change your beliefs. When you come to the matter of what really happened, nobody really knows for sure, because everybody has a different take on it. Jones is one of the five who left the project after the first script read-through, along with Carlease Burke, Phil Casnoff, and one other. McAleer rejects this, and called it “racist nonsense” when one Twitter user said the Michael Brown story should be told by a black writer. I grew up a Catholic in Northern Ireland, with a completely paramilitarised police force that went around in armoured cars and tanks, that actually had a bona fide ‘shoot-to-kill’ policy. So people need to back off the allegation that I don’t understand what it’s like to be in a minority situation with a police force that’s made up of the majority. I know exactly what it’s like. At time of publication, “Ferguson” was still scheduled to begin its stage run in Los Angeles on Sunday. Eight actors had left the project, after a meeting on Thursday evening. You can read the Ferguson grand jury transcripts in full here. Email “Irish playwright embroiled in controversy over play about death of black teen”. 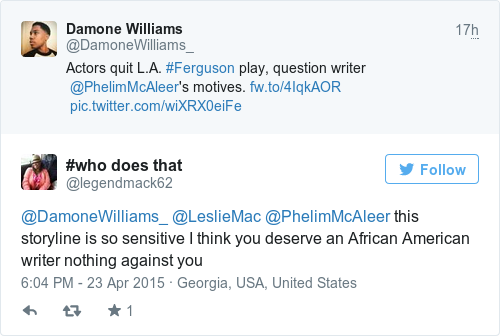 Feedback on “Irish playwright embroiled in controversy over play about death of black teen”.